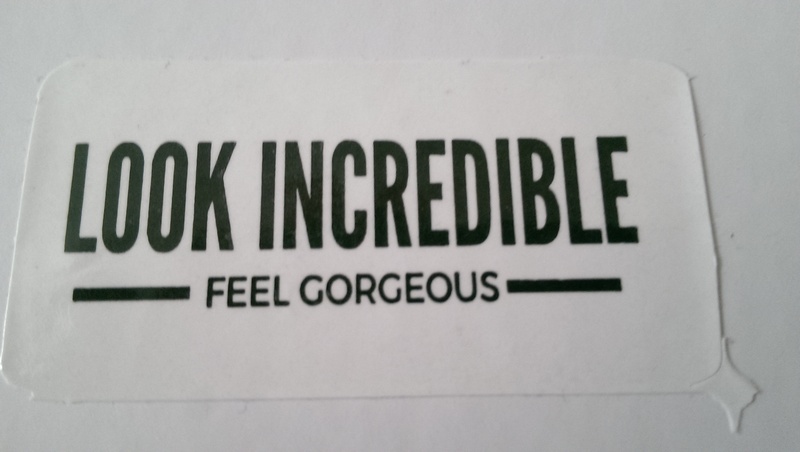 Look Incredible does two different beauty boxes – their standard costs £18.95 and is usually worth approximately £70-80, the deluxe box costs £35 with approximately £100 worth of products. But which one is the best purchase. This month I ordered both to do a comparison. The standard box contained 5 items worth £76.50 in total. All items are full sized. Stila All Over Shimmer Liquid Luminizer (RRP £16) – a shimmery summery liquid designed to give you a lovely glow. Most likely this will be used as a liquid highlighter for those days I need a bit more shine. Velvet 59 Matte to the Max Liquid Lipstick in Pink Cadillac (RRP £17) – I quite like liquid lipsticks but this baby pink shade isn’t for me. Ciate Manicure Set (RRP £16) – this set comes with polish, foil fix glue and metallic colourfoil sheets for a glam, shiny finish. I will definitely be giving this a whirl. No7 Exceptional Definition Mascara (RRP £11.50) – as regular readers will know I can’t stand getting mascaras in beauty boxes, it feels lazy and I’m fussy. However, my mum is a huge No7 fan and will be thrilled that she still doesn’t have to buy any mascara! The Body Shop Moroccan Rhassoul Body Clay (RRP £16) – this is a clay mask for your body, Rhassoul clay is famed for its skin firming powers, and I will be busting it out to get my milk white pins looking summer ready. The Deluxe box contains four items, all full size and worth £112. 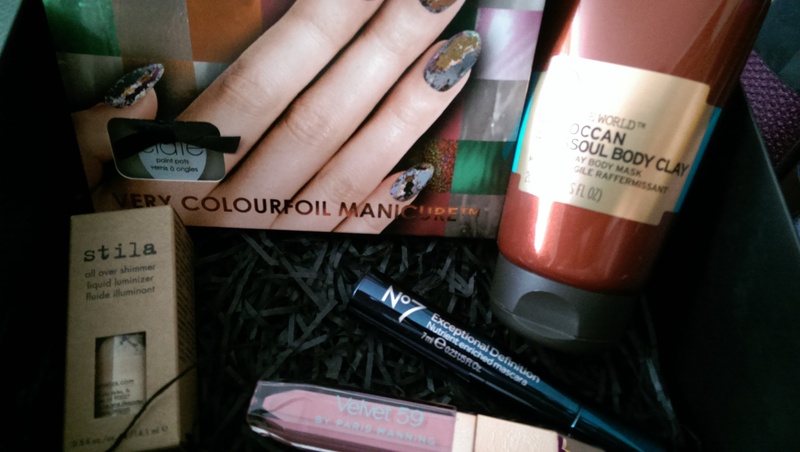 Nars Audacious Mascara (RRP £21) – another beauty box, another mascara. This is a fancier one with a heftier price tag and a friend of mine swears by this one. 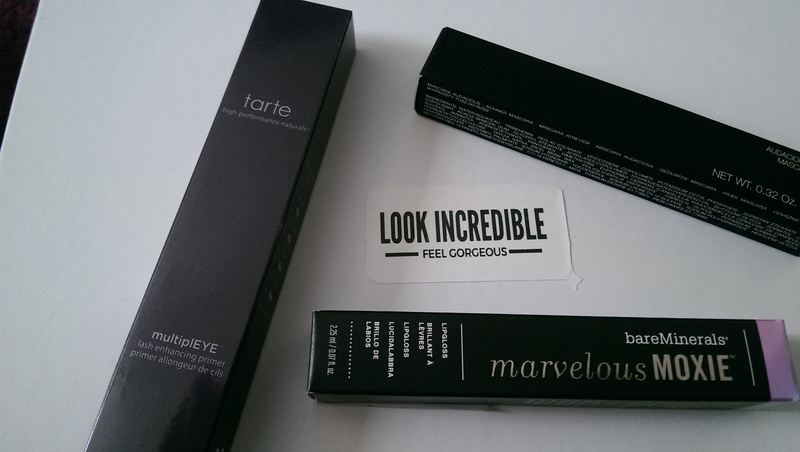 Tarte MultiEye Primer (RRP £20) – lash primers seem to be a big new thing this year, I don’t really get it to be completely honest. This one makes lots of claims to condition, nourish and lengthen lashes before you apply your mascara. BareMinerals Marvellous Moxie Lip gloss in Hypnotist (RRP £16) – not a huge lip gloss fan, my hair sticks to it and it doesn’t always suit me, but I do quite like this one. It’s full of natural ingredients and the colour isn’t too glittery. 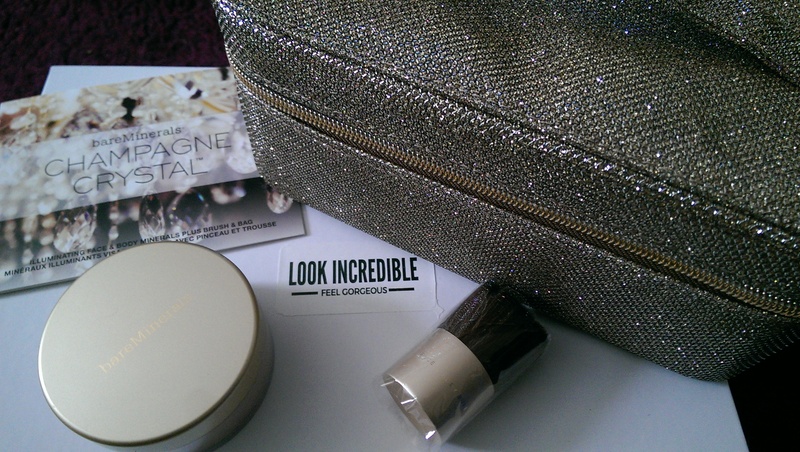 BareMinerals 3 Piece Champagne Crystal Collection (RRP £55) – a chunky make up case, complete with a brush and shimmer powder – this screams Christmas gift set to me. Which might be a bit harsh but I honestly don’t think it’s worth the hefty price tag for one product and a brush. The verdict – personally I think the mix of products and value of the standard box outweighs the deluxe box. It might seem more a bargain, but considering one item was more empty space than beauty product it just doesn’t seem so deluxe and I would have liked it if all the items were from different brands.